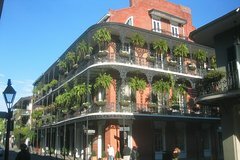 Take the tour in the location where the Creoles lived; the magnificent French Quarter or sometimes known as the Vieux Carre'. Dating back to 1718, Judy, however, begins the tour in the year 1540. Find out why on the tour where the Louisiana Purchase was signed. See the fabulous Pontalba townhouses, dating back to 1850. We will also enjoy the breathtaking architecture, while making several indoor stops. One to sure be enjoyed; Antoine's, the oldest family owned restaurant in the United States, 1840. The tour concludes at Newton's Hot and Cold Gelato for complimentary gelato. Much history from a former history teacher and CIvil War Historian.